Adrian Riggs, right, looks over the control room of the new PET/CT imaging system. 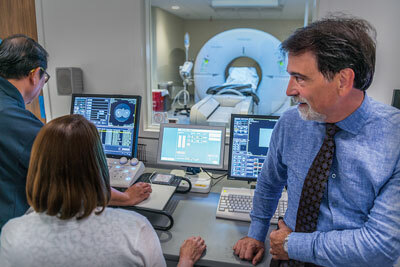 A $1.8 million Toshiba Celesteion PET/CT imaging system is the centerpiece of Solano Diagnostics Imaging’s new location in the VacaValley Wellness Center. It is the only stationary PET/CT scanning equipment in Solano County, other than David Grant Medical Center at Travis Air Force Base. Because of the machine’s larger size, patients feel comfortable and less claustrophobic during procedures. A positron emission tomography (PET) scan is an imaging test that uses a radioactive substance called a tracer to look for disease in the body. 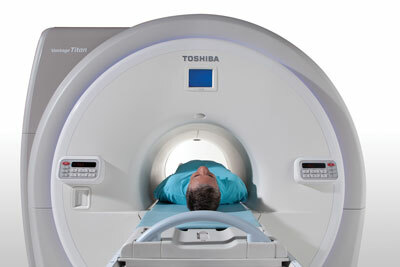 The new scanner includes Toshiba’s AIDR 3D technology that helps reduce the radiation dose needed by patients. A PET scan shows how organs and tissues are working by measuring blood flow, oxygen use, glucose metabolism and other body processes. It is commonly used to detect cancers because it shows tissue abnormalities at the cellular level. The machine features the largest bore—space for the patient—in the industry. This means larger patients will feel comfortable and less claustrophobic during their procedure. It is also faster, which means less exam time for patients. “For the first time we will be able to offer outpatient CT scans as well as inpatient PET scans in Vacaville,” Adrian added. X-Ray: An X-ray is the most common imaging test used to help doctors view the inside of the body. Your physician may order an X-ray to diagnose a broken bone, view an area where you are experiencing pain or to monitor the progression of a disease, such as osteoporosis. Mammography: A specialized medical imaging that uses a low-dose X-ray system to see inside breasts. A mammogram aids in the early detection and diagnosis of breast diseases in women. 3D Mammography: Three-dimensional (3D) mammography is a type of digital mammography in which X-ray machines are used to take pictures of thin slices of the breast from different angles and computer software turns the pictures into a three- dimensional image. This process is similar to how a CT scanner produces images of structures inside of the body. Bone Density (DEXA Scan): Bone density testing is used to assess the strength of the patient’s bones and the probability of fracture in persons at risk for osteoporosis. The test is a simple, noninvasive procedure that takes just minutes. Ultrasound: Ultrasound, also called sonography, uses sound waves to develop ultrasound images of what’s going on inside the body. Ultrasound imaging has many uses in medicine, from confirming and dating a pregnancy to diagnosing certain conditions and guiding doctors through precise medical procedures. Solano Diagnostics Imaging is open Monday through Friday from 7 a.m. to 6 p.m. For more information, call (707) 646-4646. A $1.5 million, state-of-the-art MRI will be installed next to NorthBay VacaValley Hospital in Vacaville this winter. 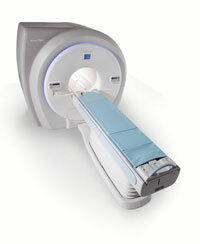 The Toshiba Vantage Titan, Open-bore 1.5 Tesla (high field) MRI features quiet technology and high definition scanning. It has the shortest magnet with the largest field of vision currently available in the industry. MR acoustic noise is one of the major complaints of patients and medical staff. Toshiba’s patented Pianissimo technology significantly reduces the noise in and around the MRI environment, making exams more comfortable and easier to complete. With Pianissimo, MRI no longer needs to be loud and disruptive. The Vantage Titan’s ultra-short open bore offers up to 100 percent more clearance space above the patient. This provides the room needed for bariatric patients and allows patients to be scanned without having their heads inside the magnet. The MRI also performs a wider range of exams, from bariatric to breast and non-contrast imaging, with far fewer limitations than Open MRI systems. Once installed, all inpatient and outpatient MRI will be offered at both VacaValley Hospital and NorthBay Medical Center in Fairfield.